If it seems like I’ve said the word “birthday” a lot lately, you’re not crazy. 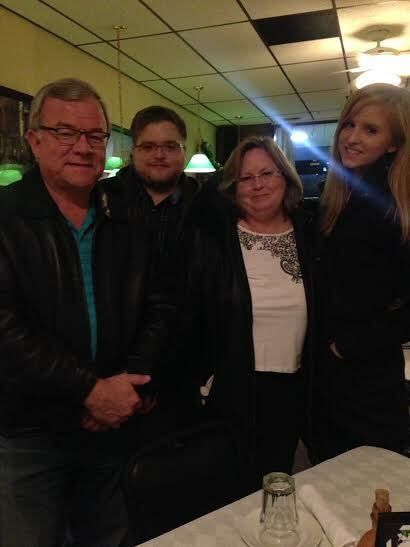 I have a four person family, and our birthdays are all within 40 days of each other (and Christmas). It’s like a birthday bonanza. Let’s just say the wrapping paper comes out once a year and then *sayonara* until next December. Yesterday was my beautiful mom’s birthday, so my WIAW is birthday/I’m-home-so-I’m-going-to-raid-my-parents’-fridge-themed. Glorious. I started the day at Sweat on State for Tabata Tuesday. We did eight 20-second rounds of each exercise which included sprints, kettlebell deadlifts, mountain climbers on a medicine ball, push-ups, weighted lunges, and sit-ups. We had a staff meeting at the store just down the street so a few of us got our sweat on bright and early at 7am, thanks to some great coaching by Erin. After the staff meeting I was a ravenous monster on my way to the train, so I stopped at my favorite bagel shop for breakfast. I wish I wasn’t so repetitive but yeah, I got another egg sandwich. This one is truly my favorite in the city, though. 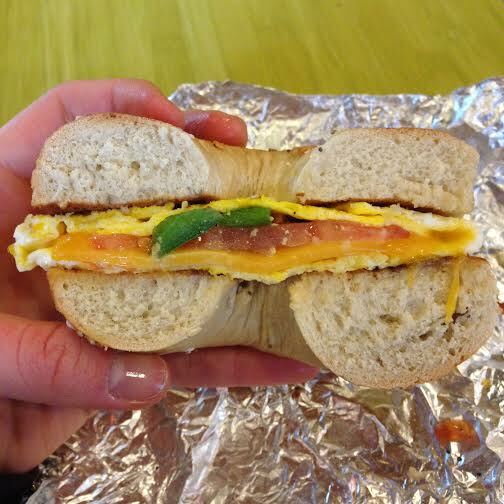 The Big Z — because nothing is yummier than an everything bagel stuffed with eggs, veggies, and melty cheddar. Get at me! I got home around noon and spent the afternoon working on Community Development for the store. I’ve basically pressed “Snooze” on my responsibilities and initiative on that front after the crazy holiday season, but it’s time to get back to business. I’m excited to see the cool fitness leaders we’ll be getting in the store for demonstrations this upcoming year. 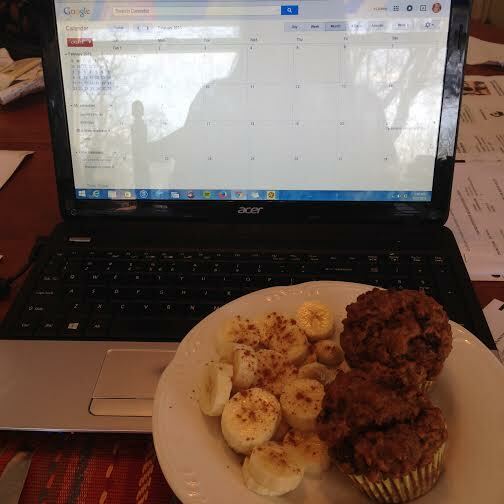 While I worked I snacked on “lunch”, or two homemade bran muffins and a sliced banana. Raisins always belong in muffins. Always. See that blank calendar? I have to fill it with community events in our store. As you can see it’s going swimmingly. The real highlight of the day was dinner. We went to a little Italian restaurant in my hometown that my parents are in love with, and now I see why. Like most dining gems, this place was unassuming at best, hidden between a liquor store and a tattoo parlor in a strip mall. Yeah. But THE FOOD. 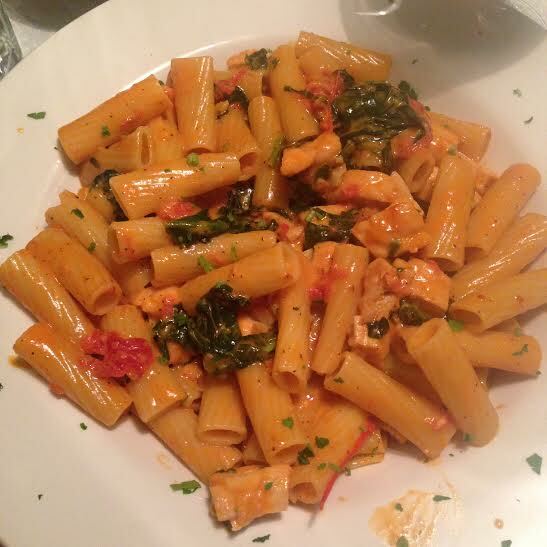 Never have I ever had vodka sauce so decadent and flavorful. Rigatoni a la Vodka. I added grilled chicken and spinach. And yes, I ate the whole thing. 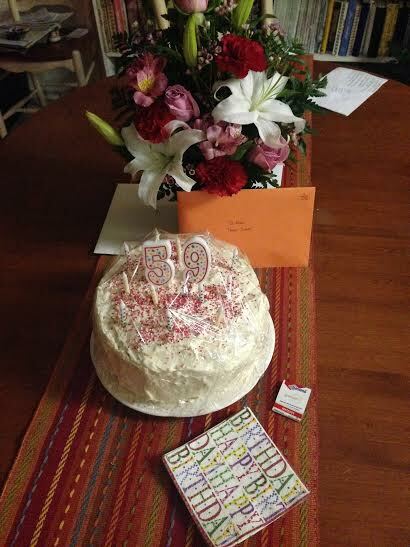 We got home and did cake and cards, a ritual that was made even more fun thanks to some Chianti-inspired laughs. Happy Birthday Maja! Thank you for being the quarterback of our family 🙂 At the end of the day I know I can always count on you for anything. Thank you for being so supportive and kind to me this past year when I was going through tough times. You rallied me through it all! You made our childhood feel like a Disney movie, always playing songs and letting us dance around the house all day, using our imaginations and just being goofy kids. We’re all so lucky to have you. 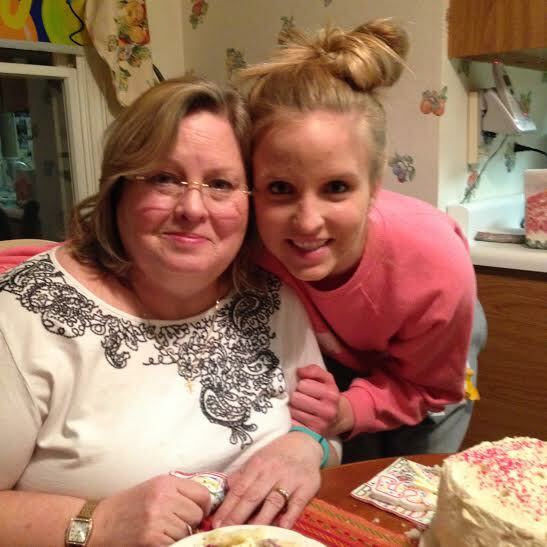 Are your family members’ birthdays close together or far apart? 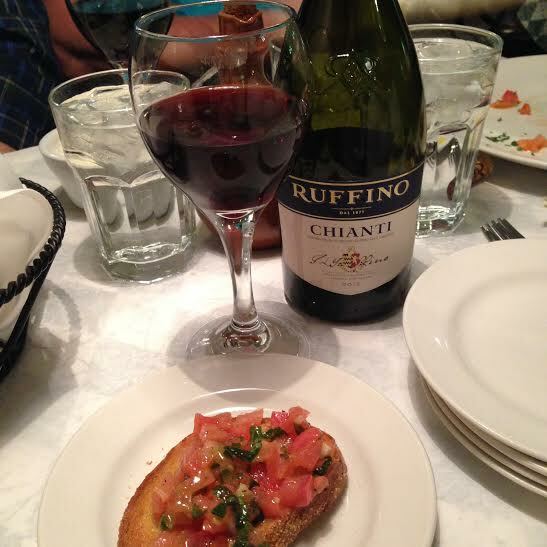 What do you order at Italian restaurants? I used to be an eggplant parmesan fanatic!